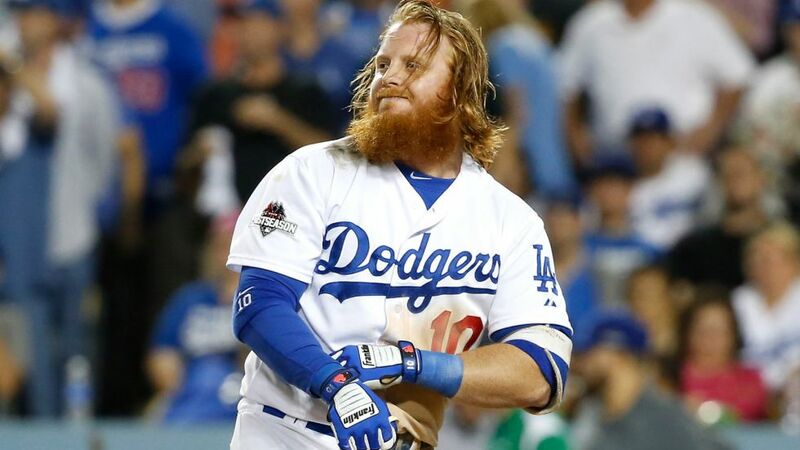 Justin Turner has had two great seasons in Los Angeles. The Dodgers signed him to be a super utility guy with a little power to come off the bench and get some playing time around the infield. He was never supposed to be the starting third baseman. Turner was so comfortable playing at Dodger Stadium that he blossomed into a bona-fide power threat. He went from being an average utility guy with the Mets, to a .300 hitter with the Dodgers and their everyday third baseman. He was a revelation. During Turner’s first two seasons with the Dodgers he posted quality numbers. In his first season in 2014 he batted .340 in 322 plate appearances and posted an .897 OPS. During his second season in 2015 he batted .294 blasted 16 home runs and posted an .861 OPS in 439 plate appearances. In last year’s NLDS against the Mets he batted .526 (10 for 19) and slugged six doubles in the five game playoff series. He was oh so dreamy. This season is a different story entirely. This season his production has disappeared and he seems to have lost his gap to gap power. So far through 35 games he is batting .240 with a .324 OBP and just one home run and nine runs driven in. He has a .654 OPS in 139 plate appearances and has just 8 extra-base hits. He’s been awful and for some reason the Dodgers are stubbornly refusing to move him down in the batting order. Turner has been primarily hitting third in the Dodger’s lineup behind Chase Utley, Corey Seager and in front of Adrian Gonzalez. When he is not hitting third, then he has been batting cleanup behind Gonzo. I don’t understand why the Dodgers don’t move him down in the order until he starts hitting. It seems like Turner has regressed back to his days with the Mets when he was essentially a league average hitter. His production this year has been even worse. I know it’s early and a small sample size, but if you look at his numbers you can see they are back to where they were when he was in New York. Has that Turner magic worn off? He never posted an OBP higher than .334 with the Mets. This season he has a .324 OBP. His WRC+ (for all you stat people) has fallen from 154 in 215 to 81 this year. It’s hard to say what’s wrong with him. His line drive percentage has dipped from 27.7% in 2015, to 22.8% this season. Although his LD% was 23.3 in 2014. So it doesn’t appear to have dropped that much. Another consideration to take in is that he’s pulling the ball less in 2016. His pull percentage has dropped from 37.0% to 31.7%. Turner also has some extreme splits this year. He hits .323 against lefties, but .211 against right handers. The Dodgers, who are a team that loves constant lineup shuffling and platooning, won’t platoon him. So we know he’s not making hard contact as much as he was the last two seasons, and he is not pulling the ball like he was either. Perhaps his injured knee has caused an effect in his batting stance? He did have knee surgery last winter and had a slow start to the spring. Whatever the problem with Turner is, he is mucking up the works. He’s hurting the club batting third. For a club that has been struggling to score runs for most of the season, it’s a big disadvantage having a number 3 hitter who can’t drive in any runs. When batting third Turner is hitting just .207 (18 for 87) with one home run and 8 runs batted in. He’s had just five extra-base hits in the three spot. He hits a bit better when batting cleanup. In that spot he is hitting .276 (8 for 29). When he leads off an inning he is hitting just .133. I don’t know what’s wrong with Turner this season. Whether it’s his knee, or just a slow start or whatever his problem is. He’s regressed, and the Dodgers can’t afford to continue to wait for him to magically come around. The Dodgers have to move him down in the order until he starts hitting again. Otherwise you have a .240 hitter batting third. Move him down in the order now before he completely turns into a pumpkin. Agree. But who bats behind the Franchise then? I think now that Howie is getting hot, time to play him more at 2b/3b/LF/whatever, and bat him 3rd. Move Turner to 5 or 6 or now. Scott good subject manner, and I agree with you about Turner. It is odd, but remember Turner was hitting like the Turner of old, at the very end of spring training. Maybe he is getting pitched a lot tougher now, and just hasn’t adjusted. Remember at the end of spring training he was hitting HRs, and was hitting gap to gap. I remember Nomar, saying that Turner should save some of the hits he was getting, for the regular season. wow, maybe he was getting hits only when i was paying attention then! Bum he should stop playing Howie in leftfield. He isn’t a leftfielder, and he should have got those hits in much sooner. It felt like Crawford throw the ball in. Howie plays to deep, because he is not comfortable playing out there. Mark – your selective memory seems to be getting worse. I suggested a trade of Puig for Stanton about a month after he came up. You then claimed it as your idea. 3 years on & suddenly it was you alone who wanted to trade him while he had his optimum value. Watford, I will go back in the archives and check that. If I stole your idea, I apologize. I do seem to recall that there were two or three others who felt that way. I’m not looking for accolades. I’m just sayin…. I’m hoping Big Red gets it going. He looks better now that he has trimmed his bush, hope it translates into more hits. I’m not an expert but he seems to be leaning over too much as he swings….. 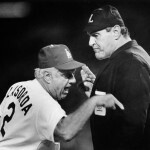 If you are talking about not living up to expectations, how about the Greinke and Shelby’s evolving debacle in Arizona! I know a few of you DBacks fans are trying to calm yourselves with the “Greinke will be okay in the long run, he’s got such talent”……. That and a dollar will get you a dollar. $206.5M over “too long” is a burden that will haunt the desert like a dust storm for years to come! My view is Greinke’s wife should have inserted herself in this decision and said whether it’s $150MM or $206MM it’s not just the money. We can be happy here in LA teaming with Kershaw and the Dodgers (#2 is easier on his psyche). It wouldn’t surprise me to see our former hero implode for reasons created in his own mind given the new expectations he has to be about perfect. His overall health would have been far better if he took the $150MM or whatever it was from the Dodgers. The greed gland gets him, his agent gets him, and the DBacks get him for six years (throw in Shelby and they have really screwed the pooch)! Too bad, I miss Greinke in blue. I will be wearing blue at the Big A on Wednesday, go Dodgers! It might be the knee, or just the abbreviated spring training. Or it could be regression. He came out like gangbusters in the spring, then nothing. AGone looked like the Babe the first two weeks of April then went into a funk. I think the reason JT is batting third is the lack of options we have for right-handed hitters. I hope dropping him in the order and/or platooning him does not become necessary, because we would pretty much be up the creek without a solid RH bat in the middle of the lineup, as several folks have pointed out. Greinke would’ve been better off here, but he’ll have to live with it. I always said Arizona could afford one bad contract with their payroll, but they gave up too much for Miller. Teams trade with the Braves at their own peril. I still think Turner should be the utility guy. Too late for that. I don’t know he can play 148. But I do think he will snap out of his slump. I don’t see anyone who is a #3 on this team. If you put Seager there, who hits #2, which is also a high value spot in the order. There were several people discussing a trade of Puig. I didn’t like the idea because his value was low, but had the haul been decent, I was ok with it. I also didn’t trust FAZ to do the right deal. Still don’t. As for Greinke, the Dbacks did that thinking of the now, not the then. If it works, and they get to a World Series, it will be worth it to them. If it doesn’t? Who knows. So far attendance ain’t all that here, up only marginally. They are in a big slump with runners on base, just like the Dodgers had. Maybe yesterday, was just a down game for the Dodgers hitters. And they will come out and have better at bats, tonight. They better not take any team on this next place on the schedule lightly. The Angels just swept the Mariners, after they lost those six games in a row. I hope the Dodgers don’t have to face Lincecum, in this series against the Angels. I believe the Angels signed him today. Gordon is suspended for PEDS. Kendrick not that much more productive than the above two. You sayin Kendrick could use some PED’s or that he has an Undiagnosed Colon Lamagasm. Did you guys see Puig and Agone doing the maken dance, after Maeda got that hit. It looks like the dance, the swim? I just don’t like Roberts having to go out of his way, to play Howie. When to many players are platooned, you never get the best out of players, because most players, need regular playing time, to be at the top of there game. Did the A’s start platooning, because it was cheaper for them? Fans in Arizona aren’t going to pay to watch a losing team regardless of payroll. Gordon may be back before Heaney. I think Howie will hit eventually, but would have rather spent the money on the bullpen. Or Dexter Fowler. I agree about the bullpen. How they let Chapman go, and had the nerve to sign Blanton, and think that was a fix, is just crazy. And most of the time, you do pay for what you get. For every rbi that Crawford hits in, he gives away a run with his arm. And having him and Howie on the left side together, makes it even worse.